The social etiquette of when and where it’s acceptable for a man to wear a hat, and the occasions on which a gentleman is expected to take his hat off are generally agreed upon. What is less agreed upon, however, is when it’s OK for someone else to take a man’s hat off. It seems that for many uncouth men and women other people’s millinery is merely opportunity to try before you buy. Or flirt. Badly. I’m talking to you drunken dance floor floozie. You don’t look cute. You don’t make me want to get to know you better. And even though I may be smiling as you do your sexiest sashay away, every second my hat is on your head, makes me hate you more. Unless you’re 10 hot. And even then, it’s questionable. According to the “Law of the West” you should never touch a man’s wife, horse or hat – and violating any of the three would likely get you a bullet. Thankfully these days not everybody is armed. Well, at least not me, but still, my advice is to play it safe. And just in case you need reason’s why, I’ve put that handy list together too. Hat head – Grabbing a man’s hat is the equivalent of ruffling a woman’s hair which is probably never a good idea always. Exception: Grandparents. Grandparent can get away with ruffling hair. Hair gel, spray and mousse – I don’t need these things because I’m wearing a hat. You on the other hand have a head full of sticky residue that I don’t want inside my lid. Dents, smudges and stains – Some hats are expensive, most hats are flimsy, and all hats are hard to clean. Lice – I don’t know if you have them, and you don’t know if I do. * Definitely not worth the risk. 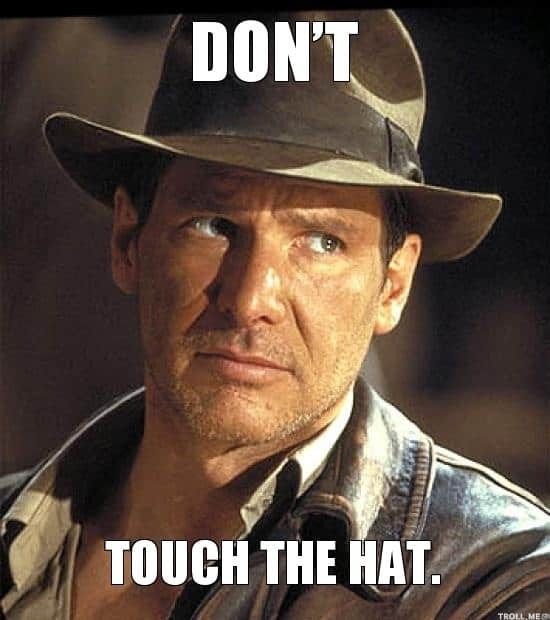 Defensive Action – Depending on the circumstances, the person whose hat you grab may not know if you ever plan on giving it back, in which case they may react unfavourably. Respect – It all comes down to this really. Have some. Oh and by the way, if you do ask to try on a man’s hat, and the answer is “no,” and you grab it anyway, whatever happens next will be entirely your fault. In my case, I may not be armed, but I just might accidentally spill my beer. On your face.